Dinan’s underdrive pulley is designed to increase power by reducing parasitic drag on the engine from spinning the alternator, water pump and AC compressor. This is accomplished by slowing down the speed of these accessory drives that rob power from your engine. Dinan has done extensive hot weather testing so you can be assured that your engine is safe. 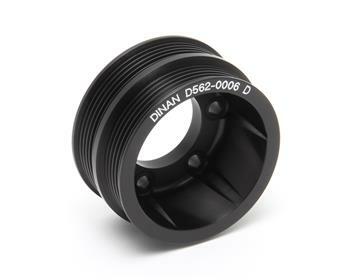 The Dinan underdrive pulley is made of aircraft quality 6061 alloy, is anodized black and does not modify your harmonic damper as some underdrive pulley kits do which can be harmful to your engine. This product is backed by our industry leading 4 year/50,000 mile warranty so you can rest assured that you are purchasing the best quality product for your BMW.